We followed the refugees up into the snowy Italian Alps, to the place where many now try to cross the high mountains into France. In Ventimiglia we had learned that more now get sent back after trying to cross the lower border there, so people are getting desperate and are taking greater risks to try to get into France. So in an Italian ski resort we heard how refugees first started arriving last summer when the French/Italian border controls were tightened up. At that time, the crossing meant a hard trek over mountain passes then dodging border guards in the valley below. However, since winter has set in things have become more serious. The mountains are now covered in thick snow and temperatures drop to between -10 to -20 at night; but night time is when people have the best chance of avoiding police detection. A local lady explained to me her fears for people walking over large areas of the mountain that are frozen solid and slippery, with no marked paths and no one to find you if you fall down injured. 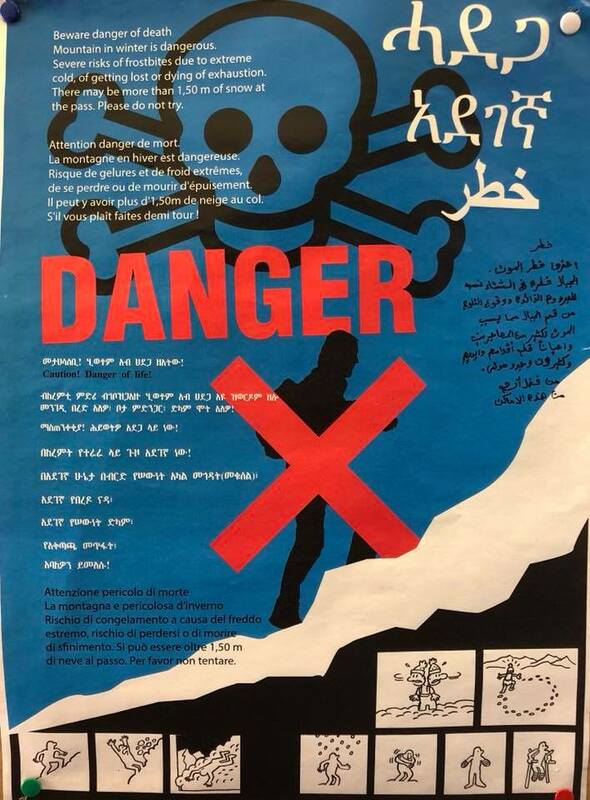 There are signs that the local villagers have put up on the walls, translated into Arabic, Pashto, and three other languages. These read ‘Danger of death … please do not try’ and ‘Please STOP… some people already died’. But coming from Calais we know that if they want to go we can not stop them and, more, they can’t go back nor stay where they are. Of the refugees we met, some were better equipped than others. The ones who had poor shoes we gave proper waterproof walking boots, and the ones who had only jackets we gave winter coats. That was what had brought us here. I had seen a young man on TV who attempted this walk in poor shoes and lost both his feet to frostbite. The sight of his stumps deeply upset me. Europe’s policy of closed borders and increased security is forcing people to take extreme and unnecessary risks and this is the horrific consequence. At 9pm a group of locals arrived with hot food for the refugees. They are part of an informal group that do this every night and bring amazing good cheer and solidarity to the reality of the cold street. By now it is between 0 and 2 degrees. At 11pm a local association, R@inbow for Africa – R4A arrive. They have a delicate agreement with the local mayor to open a small room near the train station to provide overnight respite to the refugees, but the hours are strictly limited to 11pm to 8am. We crammed their small storeroom full of the walking boots, coats, thermals, socks and gloves, survival bags and emergency blankets that we had brought. We hope that during the February snow these will keep some young men a little more prepared. As long as Europe has no solutions they will continue to arrive. We left just after midnight, scared to think where the boys we had met would be the next day.